Select a size or option from the drop-down box. If there is no drop-down box, there is only one choice of product. Entry with OS showing indicates Out of Stock. Add the quantity required and click the Add to basket button. 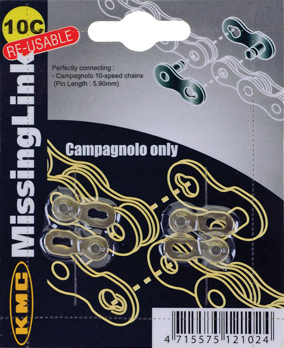 10 speed 'missing link' chain connectors specifically for Campag chains. Supplied carded containing 2 pairs of replacement connectors. These can be re-used after cleaning the chain. 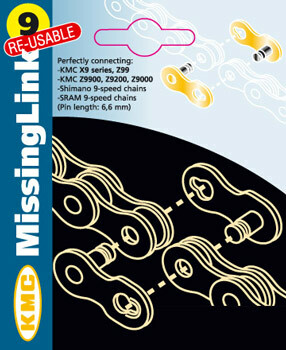 10 speed 'missing link' chain connectors for KMC and Shimano 10 speed chains. Supplied carded containing 2 pairs of replacement connectors. Works with all chains of 6.05 mm width. These can be re-used after cleaning the chain. 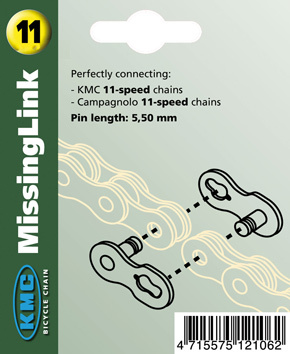 11 speed 'missing link' chain connectors specifically for Campag chains. Supplied carded containing 2 pairs of replacement connectors. These are NOT reusable. 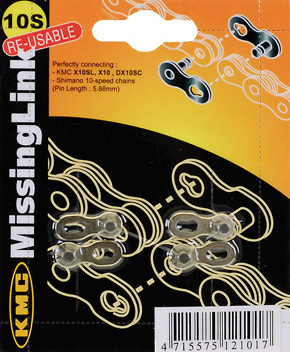 8 speed 'missing link' chain connector Supplied loose in bag containing 1 pair of replacement connectors. Works with all chains of 7.1 mm width. These can be re-used after cleaning the chain. 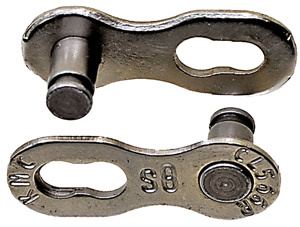 9 speed 'missing link' chain connectors Supplied carded containing 2 pairs of replacement connectors. Works with all chains of 6.6 mm width. These can be re-used after cleaning the chain.